ALAMEDA, Calif. (KGO) -- Raider Nation is pumped. 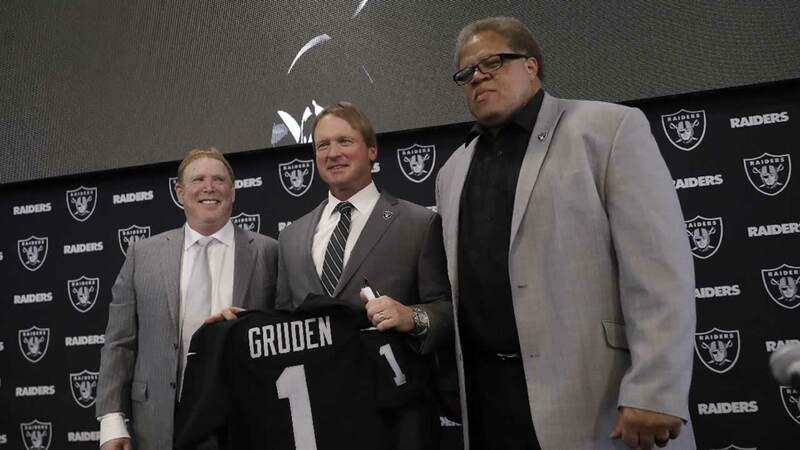 Fans of the Silver and Black gathered outside team headquarters on Tuesday as the team officially announced the return of Jon Gruden as their new head coach. The culture change could be felt when Gruden entered the building. "I never wanted to leave the Raiders and never thought I'd be back but here I am and ready to get to work," he said. Gruden coached the Raiders from 1998 to 2001 and was then traded to Tampa Bay by Al Davis for four draft picks and $8 million. Former Raider Charles Woodson asked Gruden if he had a no trade clause this time around. Gruden has been away from coaching for almost a decade. But he has seen the changes in the game and the players as an analyst for Monday Night Football and holding QB camps. Will he change his style for the updated game and players of the NFL? "I got a lot to prove, I know that. But the game is still decided by players between the lines and we all have to adapt every year," he said. "I don't think he can change or should change. He has to be who he is," said Raider Hall of Famer Tim Brown. "I told Derek Carr earlier, it's going to be a grind, a real grind, but hang in there with him and he'll take you places you never dreamt of going." Coach Gruden said this was the only franchise he considered returning to for a couple distinct reasons. "Big reason I'm here is my passion for the city of Oakland and this franchise and the Black Hole. If you're listening, can't wait to see you guys, can't wait," he said. His new contract will be $100 million for 10 years, which will take him with the franchise to Las Vegas in 2020. Click here for more stories on the Raiders. AFC West get ready to rumble. JON Gruden is back. Charles Woodson asked if JON has a no trade clause after Al Davis traded him to Tampa. JON said No trade baby. Gruden wants to monitor players social media. JON has never met Marshawn Lynch but looks forward to it. They both came back to the team they love. JON feels like he has unfinished business .